In 1999, to much fanfare, Ferrari launched a car called the 360 Modena. It was one of the hottest performance cars in the world at the time and with a smooth, dry race track at your disposal it would crack 0-62 mph in 4.5 seconds. What relevance does this have to the Audi RS Q3, you may ask? Well not a lot, apart from the fact that this relatively mainstream compact SUV will dispatch the same sprint in 4.4 seconds in Performance trim. For that matter, it will do more or less the same time on a damp road with a week’s worth of shopping on board. Of course, it’s not the only one. The Porsche Macan and the Mercedes GLA45 AMG also provide sports car-slaying performance in a compact, four-wheel drive package. The RS Q3 was one of the first of the breed, however, and recent tweaks have ensured it remains competitive in this amusingly barmy sector. Price-wise, the base RS Q3 sits fractionally above the Mercedes at £45,810, while both are substantially cheaper than the Porsche in real terms. Even at £49,185 (OTR) for the Performance model – here optioned to £53,050 – it undercuts a similarly quick Macan Turbo S by nearly ten grand. Inside, the interior lacks the flair of the Mercedes or the opulence of the Porsche, but it’s hard to fault in terms of functionality. The seats are a fantastic blend of comfort and support, while all the controls fall nicely to hand. It’s a shame the RS Q3 doesn’t get the excellent Virtual Cockpit system that’s creeping in elsewhere in the Audi range, but the infotainment system is still reasonably intuitive and the optional Bose stereo sounds superb. The RS Q3 is the smallest car in its class, which helps to make it feel impressively wieldy on the road. The downside is that the boot is smaller than that of a Volkswagen Golf hatchback, while the rear seat accommodation isn’t overly generous. 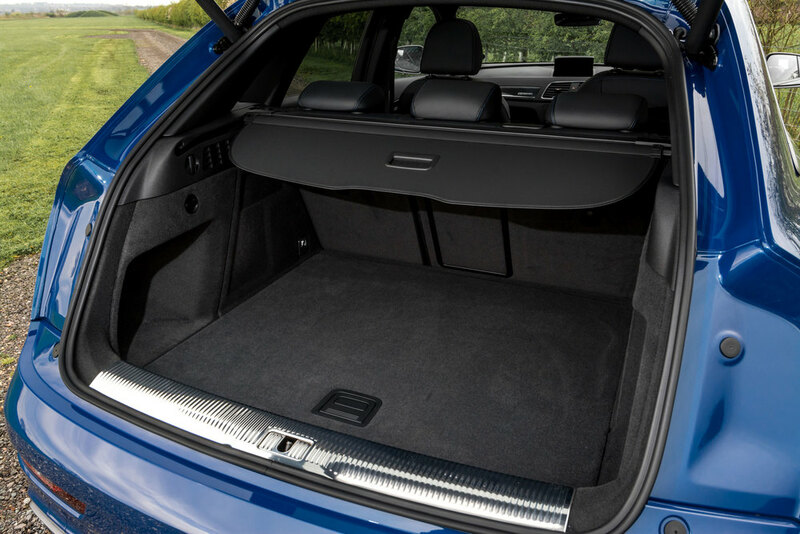 Unless you have a pack of Labradors to transport or you particularly enjoy trips to Ikea that’s unlikely to be a major issue, but it’s worth bearing in mind that the space is more compact crossover than full-size SUV. Externally, it’s a handsome looking car, discreetly beefed up without trying too hard. Unlike the coupe-on stilts Mercedes, the RS Q3 doesn’t scream at you in silhouette. This gives it hilarious Q-car potential, as we found out dispatching those who insisted on tailgating through the villages on our test route. Once the road opens up, the RS Q3 reveals impressive point-to-point pace. Traction is seemingly unimpeachable – at least in the dry – with bags of lateral grip. There is a little bit of body roll to contend with – and indeed some squat out of the slower corners – but that’s to be expected in a car with at least token off-road pretensions. The good news is that it feels relatively agile and you can sense the torque shuffling between front and rear just enough to provide a sense of involvement. The steering is nicely direct, although it feels a bit too light in Comfort mode and takes on a slightly rubbery self-centring effect in Dynamic mode. Our test car had the standard fixed rate dampers, which did a good job of rounding the edges off the low speed bumps. The piece de resistance, however, is the RS Q3’s five-cylinder heart. Lifted from the old TT RS but here tuned to 367 PS (340 PS in the standard RS Q3) it sustains its maximum torque of 465 Nm right the way from 1,650 rpm to 5,550 rpm. Despite the characteristically turbocharged torque, it revs well and responds crisply, pulling to around 7,000 rpm. It sounds good too. In a way, the RS Q3’s engine is a fairly apt metaphor for the car in general (and indeed the segment as a whole). It’s hard to think of a time when you’d strictly need an engine that warbles like a Group B rally car or pulls like a ‘90s supercar in a compact SUV. Similarly, even the official figures put the RS Q3’s thirst at 32.8 mpg and most real world situations would be handled equally well by a nice sensible TDI-engined Q3. But it’s precisely the fact that is a bit bonkers which appeals. Chasing a pair of sports bikes down a twisty B-road left us grinning like imbeciles – in a car originally designed for the school run and occasional trips to the gymkhana (the local Pony Club that is, not Ken Block). So it’s unlikely to be a purchase you’d justify rationally and it’s by no means the only compact SUV catering to those with a mischievous side. Thanks to its punchy, charismatic engine and impressive ground-covering pace, though, the RS Q3 deserves a closer look if you’re in the market for this sort of machine.